Carbon dioxide (CO2) levels reported to have reached 400 ppm at Mauna Loa Observatory sent climate change activists like James Hansen, Al Gore, 350.org and Scientific American into a frenzy but Friends of Science say solar and ocean cycles are the main drivers of climate change, not CO2. With no global warming in 16 years despite a rise in CO2, the role of declining water vapor in upper atmosphere partially negates the ‘heat-trapping’ effect of CO2. The UK Met Office global temperature index shows no warming trend for the last 16 years, a period when 33% of all human-caused CO2 emissions since the industrial revolution occurred. We urge the public to remain calm; there’s been no global warming in 16 years. Friends of Science point out that the 350 or 400 ppm marker of CO2 in the air is one that has been made up arbitrarily. Gregory goes on to explain that declining upper atmosphere water vapor was never considered in the original anthropogenic global warming theory. Gregory explains that climate models falsely assume water vapor and clouds amplify the CO2 effect three fold, but they actually counteract the CO2 effect. 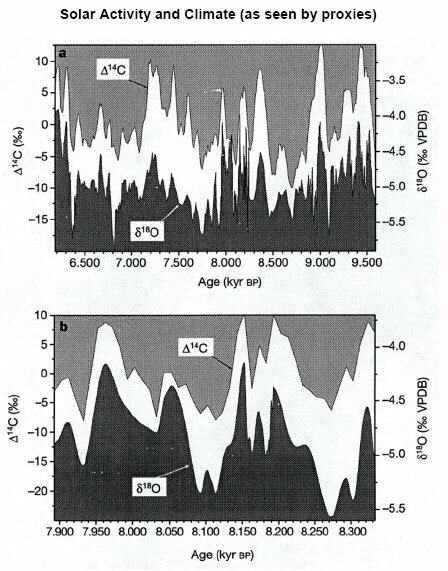 “This is one reason why there has been no warming in 16 years," says Gregory. Friends of Science point to the solar cycles and associated oceanic oscillations as keys to understanding climate change. "We have over three thousand years of evidence, tracking solar sunspot cycles that correlate well to cyclical climate patterns,” says Gregory. “Numerous studies show very high correlation between solar-magnetic activity and global temperature, yet these solar effects are not included in any climate model. 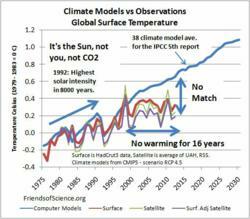 All solar warming is misattributed to CO2 in the climate models." Friends of Science also note that ‘heat-trapping gas’ is an inaccurate description, popular in the media and frightening to the public. Friends of Science point out that there is a huge public relations machine behind global warming alarmists. The charge is lead by high-profile personalities like Al Gore, James Hansen, Robert Redford and Darryl Hannah. Europe’s rush to renewables and green energy left Britain virtually powerless during an extreme cold snap this spring when their 4,500 wind turbines could only produce 0.3% of the nation’s power requirement one cold day. Recently a new climate skeptic, anti-wind farm party known as UKIP, swept local elections in the UK. Friends of Science have spent a decade reviewing a broad spectrum of literature on climate change and have concluded the sun is the main driver of climate change, not carbon dioxide (CO2). The core group of the Friends of Science is made up of retired and active earth and atmospheric scientists. Membership is open to the public and available on-line. P.O. Box 23167, Connaught P.O.